The Chinese have a strategic problem in the South and East China seas. China is obviously interested in what happens in these waters. There is much speculation as to why the level of interest is so high. The answer is simple: China wants to keep foreign powers away from its coast and away from waters vital to its global trade routes. China’s greatest threat in these waters is the United States. Given the size of the US Navy and the location of the islands off China’s coast, the Navy is capable of blocking China’s access to the ocean. This would deal a serious economic blow to China. Countering this threat means building a navy that could challenge the US… a far from easy task. So, China’s actions in these seas are meant to intimidate regional countries away from American influence. The goal is to boost China’s ability to control shipping lanes. This calls for a show of strength. 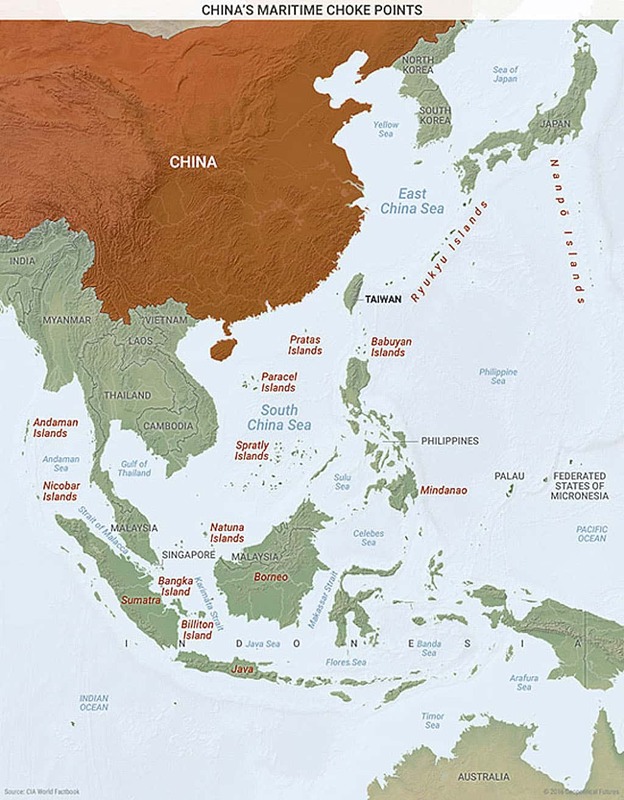 China has taken some expansive and unprecedented actions in the South China Sea, pressing excessive maritime claims contrary to international law. Its construction—and subsequent militarization—of artificial islands on disputed features far surpass all other land reclamation efforts by other nations there, all other[s] combined. And when other aircraft, ships, and even fishermen act in accordance with international law near these features, China tries to some times to turn them away. The Chinese shot back by charging Carter with having a Cold War mindset. Rhetoric aside, Carter’s comments stress the weight of ongoing events and merit a closer look. There has been ample debate that China’s interest in the seas is linked to resources. Observers—notably those in the business sector—tend to believe that an economic motivation lurks behind every strategic move. Frequently, one does. In this case, tapping oil that might be in the seabed would be very costly. In light of the current and foreseeable market for oil, this is not a viable plan. Moreover, oil platforms at sea are highly vulnerable to air attack. Extraction costs and exposure risk would render oil drilling irrational. So, let’s look elsewhere. The real economic issue is that China’s coastal zone is hemmed in by large and small islands that stretch from the Strait of Malacca to Japan. These islands create fairly narrow passages, with many too shallow for deep draft vessels. The size of the US naval fleet means it could easily blockade China’s coast. China wants to erase this threat. Its moves are designed to intimidate countries on the perimeter of these two seas, from Japan to Indonesia. The logical path to achieve this goal would be for its navy to take control of key islands blocking China’s access to the global oceans. The problem is that China’s navy is not up to the task. There has been much talk about the surge of China’s naval power. However, this “surge” moves China’s capability from “very little” to “some.” China remains in no position to challenge the US, even in its coastal waters. The US Navy has an interest in presenting the Chinese as a serious threat. Since the Cold War’s end, the US Navy has faced few challenges, and the fleet has shrunk in response. The growing Chinese threat supports the US Navy’s call to increase its budget. So, the Navy will estimate the potential threat to be as large as possible. This is the normal procedure for government bodies within the Congressional budgeting process. The sense of dread about the Chinese navy stems from this dynamic. But the fact is, while China has built ships, it has not built a navy that is on par with the US. The core American naval fighting force is the carrier battle group (CBG). The US has 11 such strike groups. The Chinese have yet to float a domestic-built, operational aircraft carrier, let alone a CBG. China has ships: it does not have fleets. A fleet creates a single, integrated fighting force under a unified command. Fleet operations—and having the ships fight an integrated battle—are very complex. The key is to have experienced military leaders and well-trained staff. The needed experience is passed between generations of commanders, through tradition and doctrine. The Chinese have never had the sort of navy they are trying to build today. They can build ships, but creating an operational navy poses a big hurdle. The Chinese have an alternative to a CBG and fleet operations: land- and air-launched anti-ship missiles. The Chinese might be unable to engage in surface-submarine warfare. They can, however, use missiles to force the US fleet away from crucial islands. The Chinese have developed missiles with enough range to threaten a line extending from the Aleutian Islands to Guam to Australia. The strategy is to saturate US fleet anti-missile defenses using massive salvos of missiles. This would then clear the way for China’s navy. This strategy has two flaws. First, this would require a space-based survey on the location of US ships across a broad area. A great deal has been made about Chinese anti-satellite capabilities. Yet, I strongly suspect the US—which has been refining this problem since the 1970s—is way ahead of China on this. Second, China’s missiles are vulnerable. I would assume that US technical intelligence has mapped China’s launch sites and control facilities. The US would respond to the threat using air and missile attacks on Chinese launchers. This attack would not use nuclear weapons, but precision-guided munitions able to sufficiently diminish the Chinese threat thus allowing US fleet operations in the desired waters. China is in a difficult military position. Its best strategy is to convince countries like the Philippines that they are better off aligning with China than the US. To do this, it has made fairly feeble moves around key islands, dredging sand to make new islands, moving ships around, and flying close to American aircraft. None of these tactics are strong enough to change the balance of power in the waters around China. Ironically, they have drawn an increased American presence. China can make threatening gestures toward the US but can’t afford to mount a serious challenge. The precise capability of the Chinese navy is an open debate. But to engage the US in combat and suffer defeat—even in a small skirmish—would be among the worst outcomes for China. China’s strategy of inducing shifts in the alignment of countries around the South and East China seas requires a credible naval force. But China cannot predict how capable its navy will be in combat. The political fallout from failure would cascade globally, regionally, and within China. China is currently trying to hold things together in the face of domestic economic failures. Its emergence as a global power acts as a psychological brace for the regime. It cannot afford to lose that brace. This explains why the Chinese can’t let go of the two seas issue, nor can they do anything decisive. Carter’s description of what is going on is fairly reasonable. But it does not amount to a serious military threat. China’s various minor actions have been magnified by the Chinese and the Americans for different reasons. Still, the fact is that China has been very cautious in a matter of fundamental importance to it: access to the world’s oceans. If it could have done something decisive, it would have. The risks and the realities at sea being what they are, China is likely to continue this strategy. — Beijing’s Real Blueprint in the South China Sea originally appeared at Mauldin Economics.